The old race of Rocky Mountain hunters and trappers, of reckless, dauntless Indian fighters, is now fast dying out. Yet here and there these restless wanderers of the untrodden wilderness still linger, in wooded fastnesses so inaccessible that the miners have not yet explored them, in mountain valleys so far off that no ranchman has yet driven his herds thither. To this day many of them wear the fringed tunic or hunting-shirt, made of buckskin or homespun, and belted in at the waist,—the most picturesque and distinctively national dress ever worn in America. It was the dress in which Daniel Boone was clad when he first passed through the trackless forests of the Alleghenies and penetrated into the heart of Kentucky, to enjoy such hunting as no man of his race had ever had before; it was the dress worn by grim old Davy Crockett when he fell at the Alamo. The wild soldiery of the backwoods wore it when they marched to victory over Ferguson and Pakenham, at King’s Mountain and New Orleans; when they conquered the French towns of the Illinois; and when they won at the cost of Red Eagle’s warriors the bloody triumph of the Horseshoe Bend. These old-time hunters have been the forerunners of the white advance throughout all our Western land. Soon after the beginning of the present century they boldly struck out beyond the Mississippi, steered their way across the flat and endless seas of grass, or pushed up the valleys of the great lonely rivers, crossed the passes that wound among the towering peaks of the Rockies, toiled over the melancholy wastes of sage brush and alkali, and at last, breaking through the gloomy woodland that belts the coast, they looked out on the heaving waves of the greatest of all the oceans. They lived for months, often for years, among the Indians, now as friends, now as foes, warring, hunting, and marrying with them; they acted as guides for exploring parties, as scouts for the soldiers who from time to time were sent against the different hostile tribes. At long intervals they came into some frontier settlement or some fur company’s fort, posted in the heart of the wilderness, to dispose of their bales of furs, or to replenish their stock of ammunition and purchase a scanty supply of coarse food and clothing. From that day to this they have not changed their way of life. But there are not many of them left now. The basin of the Upper Missouri was their last stronghold, being the last great hunting-ground of the Indians, with whom the white trappers were always fighting and bickering, but who nevertheless by their presence protected the game that gave the trappers their livelihood. My cattle were among the very first to come into the land, at a time when the buffalo and beaver still abounded, and then the old hunters were common. Many a time I have hunted with them, spent the night in their smoky cabins, or had them as guests at my ranch. But in a couple of years after the inrush of the cattle-men the last herds of the buffalo were destroyed, and the beaver were trapped out of all the plains’ streams. Then the hunters vanished likewise, save that here and there one or two still remain in some nook or out-of-the-way corner. 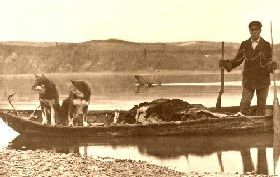 The others wandered off restlessly over the land, some to join their brethren in the Coeur d’Alêne or the northern Rockies, others to the coast ranges or to far-away Alaska. Moreover, their ranks were soon thinned by death, and the places of the dead were no longer taken by new recruits. They led hard lives, and the unending strain of their toilsome and dangerous existence shattered even such iron frames as theirs. They were killed in drunken brawls, or in nameless fights with roving Indians; they died by one of the thousand accidents incident to the business of their lives, by flood or quicksand, by cold or starvation, by the stumble of a horse or a foot slip on the edge of a cliff; they perished by diseases brought on by terrible privation, and aggravated by the savage orgies with which it was varied. Yet there was not only much that was attractive in their wild, free, reckless lives, but there was also very much good about the men themselves. They were—and such of them as are left still are—frank, bold, and self-reliant to a degree. They fear neither man, brute, nor element. They are generous and hospitable; they stand loyally by their friends, and pursue their enemies with bitter and vindictive hatred. For the rest, they differ among themselves in their good and bad points even more markedly than do men in civilized life, for out on the border virtue and wickedness alike take on very pronounced colors. 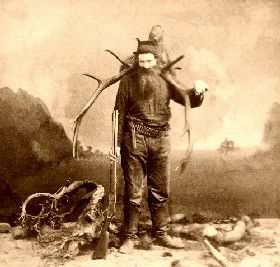 A man who in civilization would be merely a backbiter becomes a murderer on the frontier; and, on the other hand, he who in the city would do nothing more than bid you a cheery good-morning, shares his last bit of sun-jerked venison with you when threatened by starvation in the wilderness. One hunter may be a dark-browed, evil-eyed ruffian, ready to kill cattle or run off horses without hesitation, who if game fails will at once, in Western phrase, “take to the road,”—that is, become a highwayman. The next is perhaps a quiet, kindly, simple-hearted man, law-abiding, modestly unconscious of the worth of his own fearless courage and iron endurance, always faithful to his friends, and full of chivalric and tender loyalty to women. The hunter is the arch-type of freedom. His well-being rests in no man’s hands save his own. He chops down and hews out the logs for his hut, or perhaps makes merely a rude dug-out in the side of a hill, with a skin roof, and skin flaps for the door. He buys a little flour and salt, and in times of plenty also sugar and tea; but not much, for it must all be carried hundreds of miles on the backs of his shaggy pack-ponies. In one corner of the hut, a bunk covered with deer-skins forms his bed; a kettle and a frying-pan may be all his cooking-utensils. When he can get no fresh meat he falls back on his stock of jerked venison, dried in long strips over the fire or in the sun. Most of the trappers are Americans, but they also include some Frenchmen and half-breeds. Both of the last, if on the plains, occasionally make use of queer wooden carts, very rude in shape, with stout wheels that make a most doleful squeaking. In old times they all had Indian wives; but nowadays those who live among and intermarry with the Indians are looked down upon by the other frontiersmen, who contemptuously term them “squaw men.” All of them depend upon their rifles only for food and for self-defense, and make their living by trapping, peltries being very valuable and yet not bulky. They are good game shots, especially the pure Americans; although, of course, they are very boastful, and generally stretch the truth tremendously in telling about their own marksmanship. Still they often do very remarkable shooting, both for speed and accuracy. One of their feats, that I never could learn to copy, is to make excellent shooting after nightfall. Of course all this applies only to the regular hunters; not to the numerous pretenders who hang around the outskirts of the towns to try to persuade unwary strangers to take them for guides.